On 3 April 2019, the Minister of Foreign Affairs of the Republic of Uzbekistan Abdulaziz Kamilov received the UNDP Resident Representative in Uzbekistan Matilda Dimovska, Uzbekistan MFA reports. Matilda Dimovska handed over a letter from UNDP Administrator Achim Steiner to the Minister on her appointment to Uzbekistan. 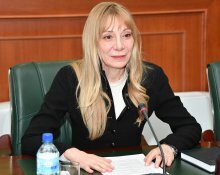 The Minister congratulated M. Dimovska on her appointment to a responsible post and wished her success. The state and prospects of relations between Uzbekistan and UNDP were discussed at the meeting. The Minister praised the efforts of the UN, including UNDP, aimed at assisting in solving environmental problems. It was noted that the launch of the United Nations Multi-Partner Human Security Trust Fund for the Aral Sea Region became an important event in solving environmental problems in the vast region.